The Moon remains in Cancer today. Today’s keyword: emotional revelation. A restless night (Moon square Uranus at 4:12 AM EDT) and “heavy” dreams filled with portent (Moon opposite Pluto at 4:59 AM EDT) set the tone for today. It looks like there’s quite a bit trying to blast its way into our consciousness, but we’re a little resistant because we’re not sure if we’re ready for the shock to the system it brings with it. The Moon in Cancer has a natural inclination to hold on to the past and to cling to the familiar, but emotional depth charges will reset the clock today. Pandora’s Box may pop wide open and who knows what will come flying out? We may feel we’re in the middle of a squeeze play, being whomped by both sides. Realize that whatever happens is a necessary breakthrough, even if it’s somewhat upsetting. Relationships with women may also be “under renovation” now. The Moon trines Chiron at 9:01 AM EDT, reiterating the “revelation followed by healing” theme. We may feel a sense of déjà vu as patterns dating back to our childhood insinuate themselves, inviting us to heal any wounds we may have sustained during our formative years. The Moon sextiles Mars at 6:38 PM EDT, pole-vaulting us into the day. Your aim is true now; follow your heart. Make it your sacred duty to protect those in your care. People may feel overwhelmed today, or are so preoccupied that they’re not paying attention, so we may need to act quickly and instinctively in order to avoid accidents of all kinds. Our reflexes may well be tested today! At 10:59 PM EDT, a Moon/Neptune connection floods the synapses, and we may find ourselves floating amid the flotsam and jetsam of an emotional tide. As noted above, today’s the kind of day that releases large quantities of heretofore unconscious material; it may cause an over-the-top reaction, especially since the Moon connects with Jupiter at 11:32 PM EDT. It’s all very stream-of-consciousness, so just let it flow. Signs and symbols may flash on by; we’re all oracles now. As we move towards the Venus/Saturn quincunx (which kicks in Wednesday at 2:54 AM EDT), we’re acutely aware of all the ways we don’t measure up in relationships. We may have to adjust our desires to current reality. Whatever we learn today can help us rebuild trust and relationship stability in the future. The Keyword for the Sabian Symbol is: “COMMAND”. Today’s Sabian Symbol reflects the strong and restless “breakthrough” energy current pulsing through the day due to the Moon/Uranus and Moon/Pluto aspects. 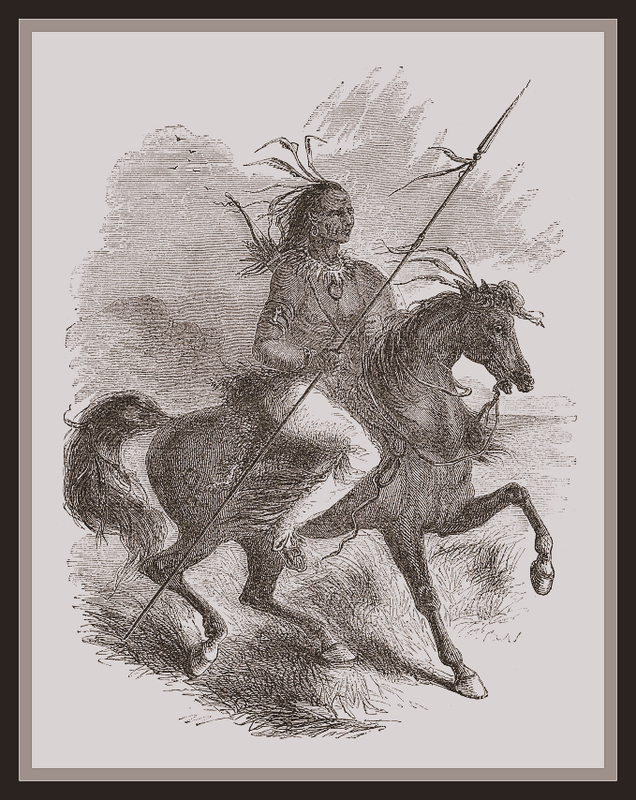 The warrior on horseback with a scalplock is symbolic of someone who has control over primal instincts (the horse) and is focused on the higher mind (scalplock is significant here). He uses both strategic war planning (Pluto) and the ability to move quickly or conduct surprise attacks (Uranus) in order to attain his aims. This image shows someone who has “earned his stripes” in battle. The warrior chooses the right time to strike, so there’s also an emphasis on timing and self-control. On the down side, this Symbol can indicate a tendency to be overly controlling or tyrannical, or getting bogged down in power struggles. We may encounter these types of people today; steer clear of people who are behaving too aggressively or erratically. Situations can escalate out of control easily, so heed any and all warning signs. The Kozminsky Symbol is very Saturnian, with its emphasis on fetters, rocks and confinement. Though the situation has been bleak, there’s a glimmer of hope in this symbol. The prisoner has escaped and is now trying to break his chains. He’s moving from a bad position to a better one, through the use of his own ingenuity. There’s now hope for the future where before there was none. This Symbol resonates with today’s themes of restraints being broken open in order to free us from being hobbled by the past. It will require adjustment (Venus quincunx Saturn) and “reentry” into the wider world. This Symbol tells us it’s time to release our attachments and free up our energy for future achievements. “Should I Stay or Should I Go?”. The first card, the 5 of Cups, reflects the Moon in Cancer and its aspects to the outer planets Uranus and Pluto. We’ve been shocked and shattered; we’re trying to remain in our shell and avoid the outside world, but that’s not an option. We’re at the point where we realize where we’ve been betrayed or have betrayed ourselves because we saw what we wanted to see rather than what was really happening. The next step is to move beyond illusion/delusion and sadness. Healing is necessary. We need to be re-inspired and reinvigorated. The Ace of Wands tells us we’re being called. New horizons beckon. The Ace of Wands bears Uranian-type energy and possesses the zest and propulsive, almost maniacal energy of Uranus in Aries, so it’s time to be bold, take a chance, and move forward. Look outward rather than inward now, make the first move, even if you feel paralyzes. That’s all it takes to get things rolling.